Dynamic mic designed for a wide variety of musical instruments, cabinets, and vocals. The all-purpose Audix f5 Fusion Series dynamic instrument microphone is designed to mic a wide variety of musical instruments, including snare, toms, percussion, guitar and bass cabinets, brass, flute, and woodwinds, as well as vocals and speech. 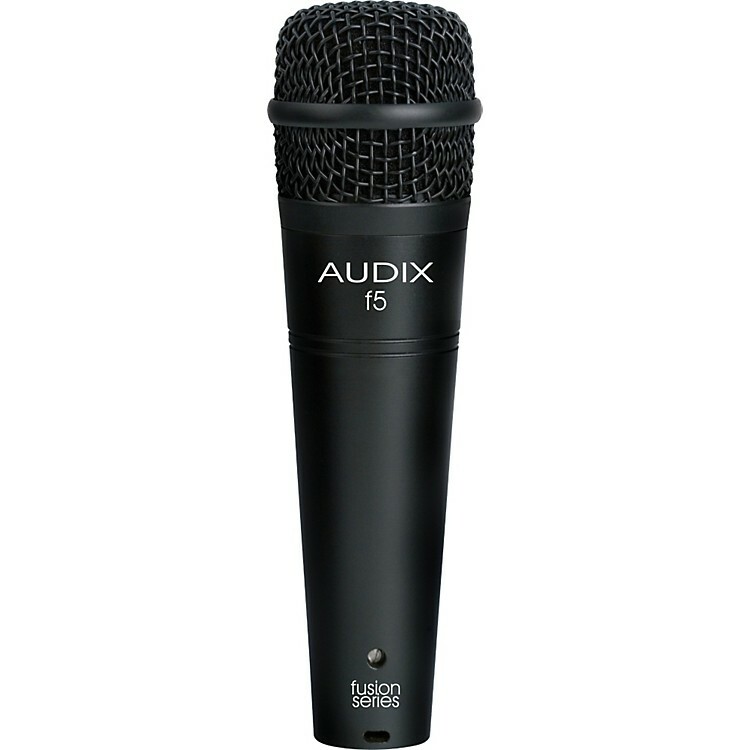 Assembled and tested by Audix in the USA, the f5 is an ideal mic for both stage and studio applications. With a wide frequency response of 55Hz-15kHz, the versatile Audix f5 mic provides clear, accurate, natural sound reproduction without having to rely on EQ. The f5 mic handles sound pressure levels in excess of 137dB without distortion, which lets you mic anything from guitar and bass cabinets to heavy brass with supreme confidence. Sturdy, compact, and easy to position, the f5's roadworthy construction includes a precision-cast zinc-alloy body, black finish, laser-etched model number, steel mesh grille, gold XLR connector, and a tension-fit, heavy-duty-nylon mic clip. The f5 has a tight (hypercardioid) pick-up pattern in order to help eliminate sound from other instruments on stage from bleeding into the microphone. For this reason, the f5 is exceptionally effective for drums and percussion in be able to capture the sound of each component of the kit. Start with the f5 about 2 inches above the head and aimed towards the center of the drum. For more "rim" effect, the f5 can be aimed less towards the center and more towards the rim. It is not uncommon for engineers to place the mic practically right on the drumhead to achieve a very tight, cracking sensation. Similar to snare. For tighter sound and more attack place, the mic closer to the head. For more decay and overtones pull the mic further away from the head. The f5 can be placed within 1-2 inches of the grill cover at a 90 angle pointing directly into the speaker. If the mic is placed closer to the edge of the speaker, you will minimize the higher frequencies and get a warmer, fatter tone. To capture more highs, move the mic closer towards the center of the speaker, but avoid the middle of the speaker. Place the mic within 1 - 2 inches of the bell, especially when on a stage with drums, bass, guitar, etc. For jazz, classical, and music where the stage volume is lower, the mic can be placed further away for a richer, fuller, sound. The f5 is a low impedance microphone and should be plugged into a mic-level input on your console, mixer, or recording device. Please note that your microphone does not require phantom power and will not be effected in any way by phantom power should it be running simultaneously when the microphone is in operation. Avoid plugging or unplugging the microphone from the PA system unless the channel is muted or the volume of the system turned down. Failure to do so may result in a loud popping noise, which could seriously damage the speakers in the PA system. A "desert island" workhorse dynamic mic that can do it all. Order an Audix f5 today!